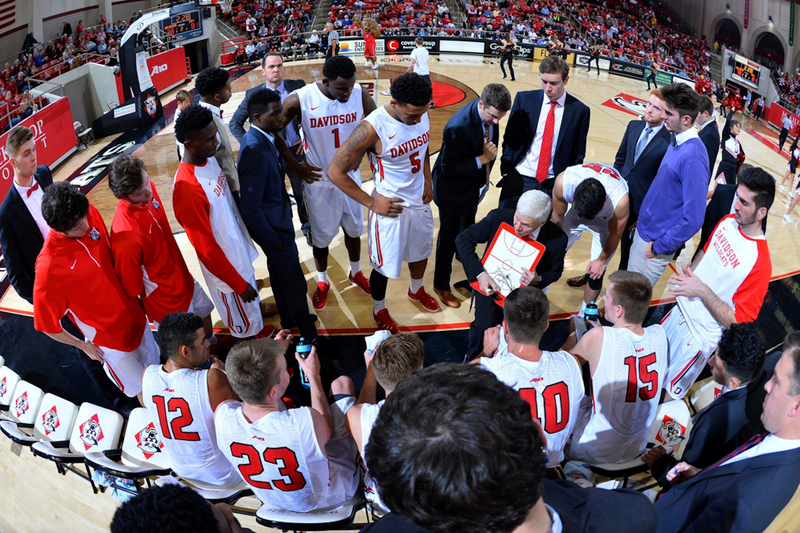 Bob McKillop talks to the Davidson Wildcats during a timeout at Belk Arena. Often times during a TV broadcast of a basketball game, fans will hear broadcasters exclaim, “What a great play coming out of the timeout. [Coach X] drew that one up to perfection!” Broadcasters may even refer to specific coaches as experts in their ability to focus a team strategically during a timeout. But other than those occasional plays that excite broadcaster and fan alike, what evidence do we have that certain teams are better than others coming out of a timeout? College coaches use most of their timeouts for two reasons: to stop another team’s run of scoring or to talk over strategy in pivotal moments of a game. In either situation, it is a positive sign if, after the timeout, a team’s offense converts the next possession into points. A way to measure this kind of offensive output out of timeouts is to look at how efficiently a team’s offense performs in the possessions immediately after a timeout. In this instance, we’ll look at Points per Possession on plays immediately following a timeout. Below is a graph of all NCAA Division I teams’ average PPP in possessions after timeouts over the last seven seasons (2008-2009 to 2014-2015) and their standard deviations from the same measure. As we can see, most team’s PPP out of timeouts vary quite a bit from year to year. This isn’t terribly surprising, as this same pattern appears year to year in the NBA. Most teams rarely rank in the same spot more than a couple of years in a row. 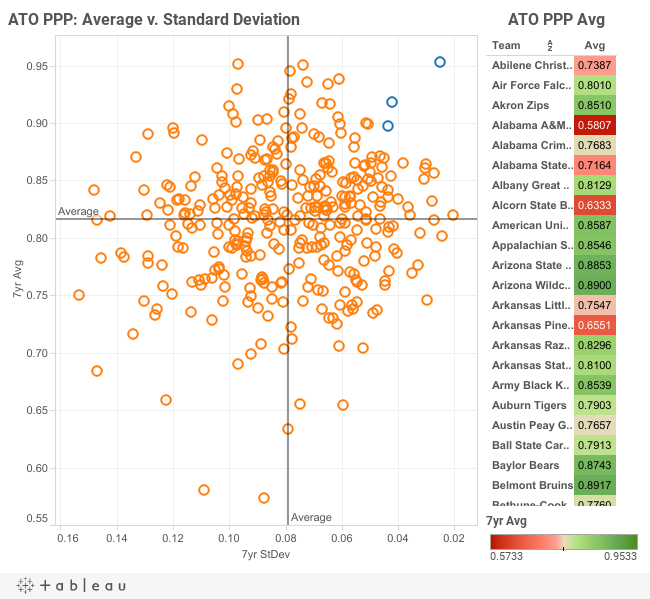 The variation for out-of-timeout PPP isn’t quite as pronounced as the NCAA, likely because there are fewer teams in the NBA, so the deviations in PPP ranking are most visible. With an exception of a few teams, most teams have experienced at least one large jump or fall throughout PPP rankings over the last 7 years. Only three teams in the country were in the Top 10 percent in both standard deviation of out-of-timeout PPP and average out-of-timeout PPP. Translation: It’s hard to be consistent out of timeouts. It’s even harder to be consistently GOOD out of timeouts. The three teams that seem to consistently execute well after timeouts were Northwestern, Duke, and Cal. Northwestern, under both Bill Carmody and Chris Collins, seems to excel after timeouts, averaging about 0.9 PPP. Cal did very well after time outs while headed by Mike Montgomery, though his recent retirement may cause the Golden Bears to take a step back, as current coach Cuonzo Martin has the team operating at about 0.05 PPP below their 7-year average. Finally, there’s the Duke Blue Devils. Duke, over the last 7 years, has averaged 0.953 PPP out of timeouts, .137 PPP better than the average Division I squad. How are the Blue Devils doing this? It could be superior athletes, a high-ranking academic atmosphere, or one of the greatest basketball coaches the world has ever seen. At the end of the day, it is likely a combination of all of those things. Nevertheless, given the variability of this data, it is quite amazing how the Blue Devils can perform so incredibly well after timeouts with their level of consistency. As for Davidson, Coach McKillop also has the boys operating at an impressive level. Davidson comes in at 16th in Division I for average PPP out of timeouts over the last 7 years. Davidson isn’t quite as high in terms of variance, with their Standard Deviation coming in at 0.750 PPP, good for 166th in D1. However, that 0.750 PPP is still 0.041 PPP better than the D1 average. By executing at a high level and an above-average efficiency, Davidson fans can expect that the ‘Cats will break each huddle with a quality plan to score on the next possession.